Calendars for Ireland 2019. 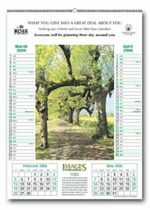 We can supply personalised calendars with pictures of Ireland or other designs. Scenic Irish pictures or Irelands wildlife and many other designs from the UK. Other calendars besides our Calendars Ireland click here. Other promotional and personalised items besides our Calendars Ireland click here. To find out more about our Calendars Ireland click here and fill in the contact form and we'll get straight back to you.